Yoshi Is Awesome! is an Event Course in Super Mario Maker, released on November 11, 2015. It unlocks the Necky Mystery Mushroom costume upon completion. 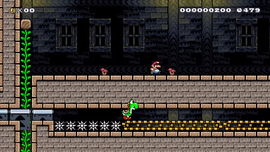 The level begins with Yoshi, along with a Bullet Bill Blaster firing Bullet Bills. Mario must allow Yoshi to get hit by one while facing right, and follow from below, passing an arrangement of Hard Blocks and Ice Blocks to read "FAMITSU". Mario must then climb a beanstalk, then hit a P Switch so that he and Yoshi can cross into the next segment together, which consists of Munchers. A warp pipe closely follows, leading to a segment of Big Venus Fire Traps that Yoshi must take out by spitting their fireballs back at them. Mario must then disembark from Yoshi to get another Yoshi up and to the left. The two must then navigate some Grinders, and Mario must disembark Yoshi again to get yet another Yoshi. The two must then utilize a Big Spiny in a Koopa Clown Car to reach another segment. Yoshi must eat and spit out a P Switch, and hold onto a Super Mushroom, for Mario to travel downwards, leading to another segment with spikes. Yoshi must spit out the Super Mushroom, and the two must navigate the spikes to the Rotating Blocks up ahead, which Mario can take out with a spin jump. Afterwards, the two must make a running jump to make Mario disembark Yoshi and reach another warp pipe. Yoshi and the Giant Gate await immediately afterwards. This was the winner of a course-creation contest in Famitsu, a Japanese gaming magazine. Here's a comment from its creator, Vanilla KONDO: "I combined ideas from courses I've already uploaded and added a few new tricks too. Mario's adorable yet reliable partner Yoshi plays a big role from beginning to end." French Yoshi est trop fort ! Yoshi is awesome! This page was last edited on January 31, 2019, at 00:33.